AKRITI – ASHTA PRAHAR is a solo thematic Kathak recital exploring the theme of flow of time in a day through eight time-zones (prahar) through rendition on various Raags suited to each “prahar” (set of three hours as per ancient Indian clock system). 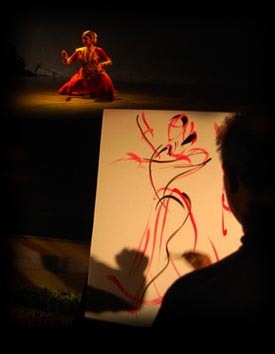 Each Prahar has a unique mood and has been evoked through dance- a visual poetry incorporating expressions within the abstract and concrete. The Kathak recital starts with Brahma-muhurt (first prahar) and gradually flows to the different time-zones and end at the starting point i.e, “Brahma Muhurt”. Dance sequences in Raag Lalit, Todi, Nat Bhairav, Patdeep, Khamaj, Shree and Hamsadhvani seek to represent each Prahar on physical, emotive and spiritual planes.